Croatia has islands for days, 1,500 to give you an idea and only 50 of these are inhabited. 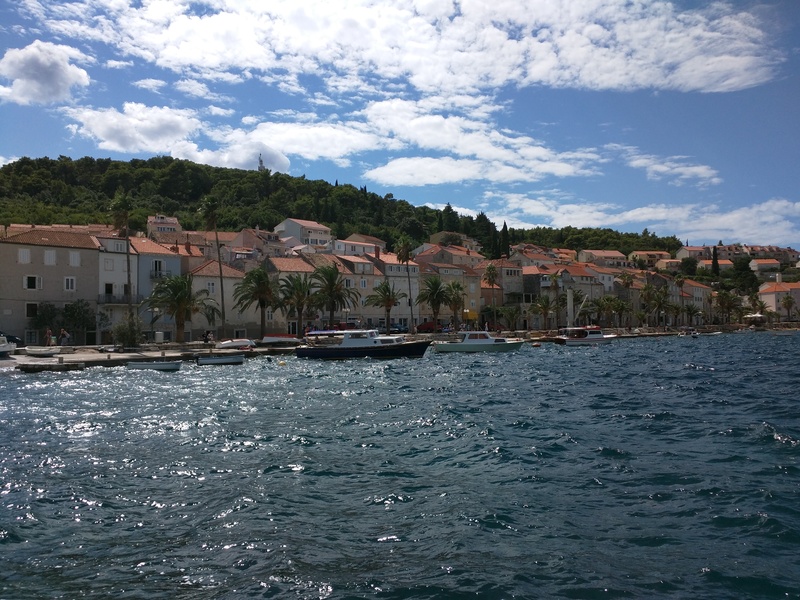 We wanted to make sure to experience island life while traveling in Croatia so we decided to visit Korcula which is an island off of the mainland of Croatia and about 2 hours from Dubrovnik. Korcula is one of the smaller islands but known for its wineries, olive oil, and some of the only sandy beaches in Croatia (most of the beaches are small smooth pebble beaches). 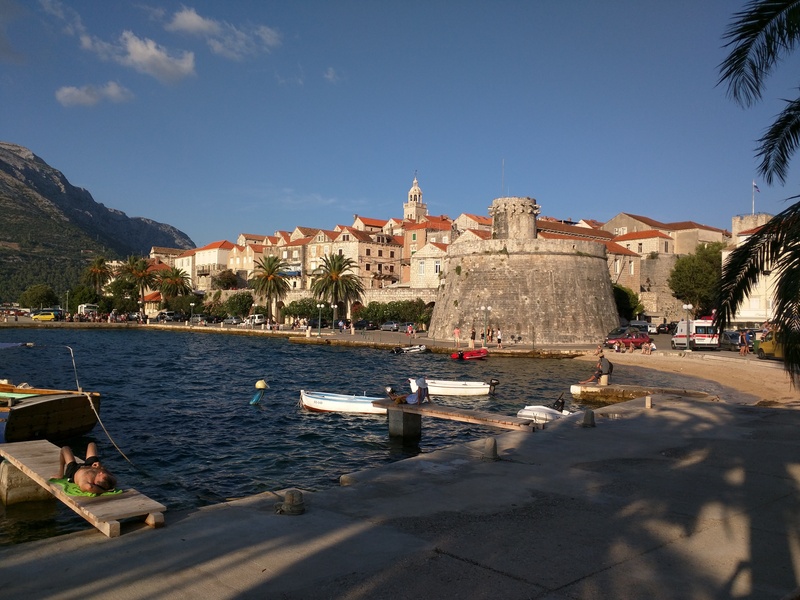 Korcula looks similar to Dubrovnik with a stone wall surrounding the city and windy medieval streets filled with shops and restaurants. 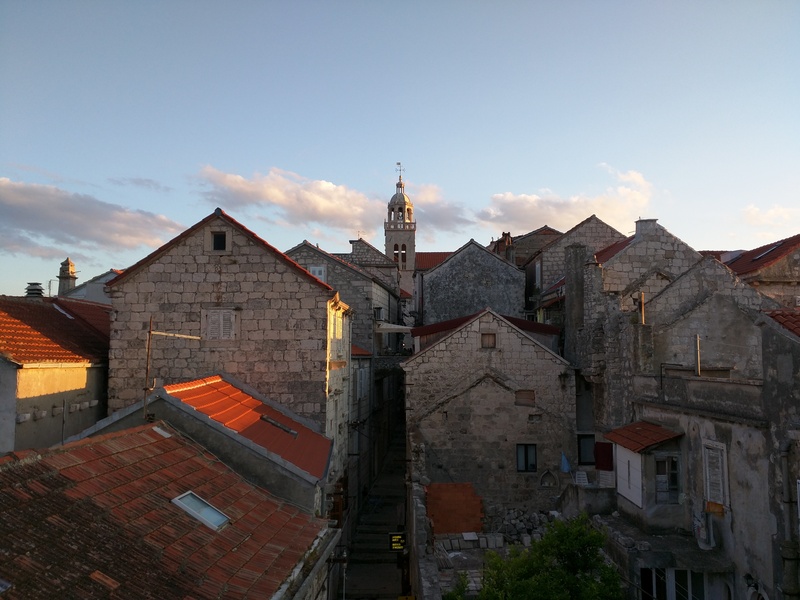 We only had a few days in Korcula and those were spent swimming in the crystal clear water, enjoying the al fresco dining, and visiting the local wineries. View of rows of houses on crystal clear water. Our apartment was just a few steps from the water. View of Old Town Korcula. The water here is unreal! You can see to the bottom and it is an amazing teal color that changes how deep the water gets. 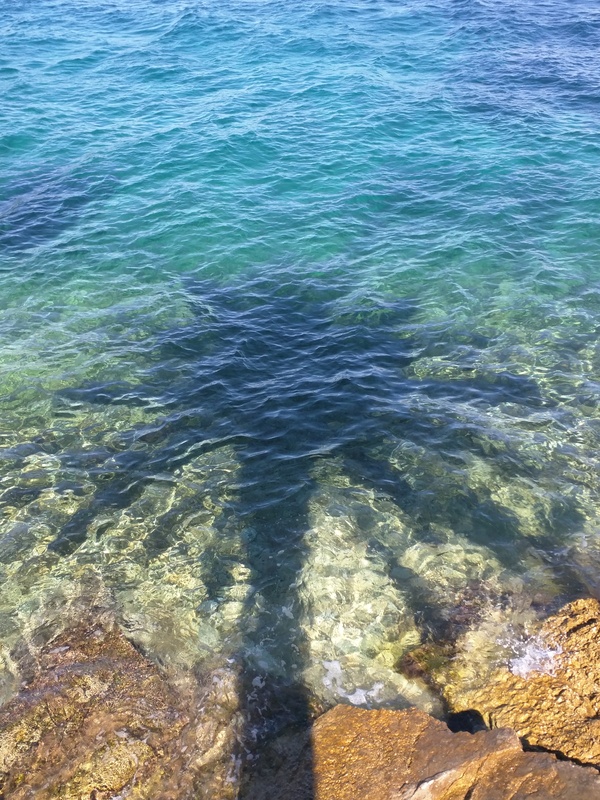 We spent two days while in Korcula at the rocky beach near the city snorkeling and enjoying the water. Palm tree with multi colored water. So clear! The main town of Korcula is really small so we decided to rent a scooter and explore the nearby towns. We went to a sandy beach and then went to a winery. 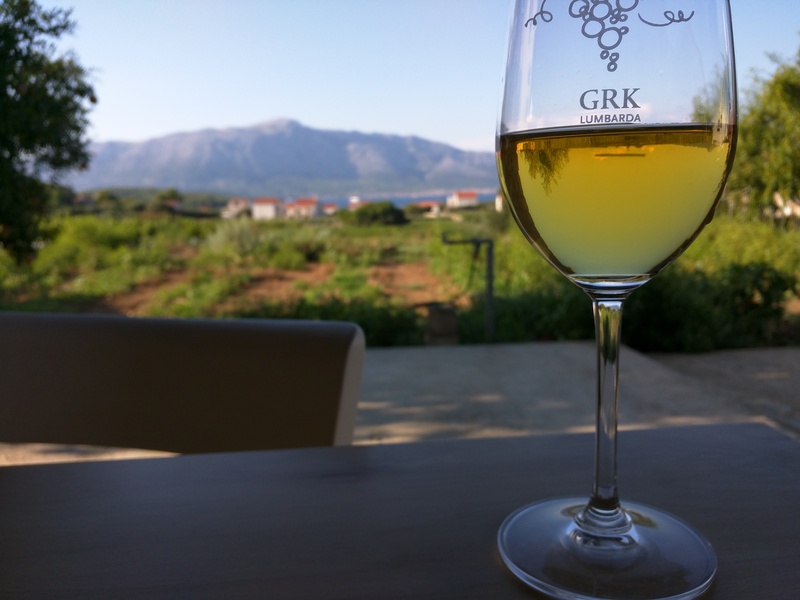 There are two types of grapes grown on Korcula GRK and Plavic Mali. Apparently the GRK grape can only grow with other grapes nearby so that is why you will normally see GRK and Plavic Mali grown together. The GRK was really good and tasted like a more fruity chardonnay and the Plavic Mali was a little too dry for our taste. We also rented a scooter so we could have a ride to a restaurant about 3km from town on top of the island, Konobo Belin, that had great reviews on trip advisor. This restaurant was totally worth it! Wine by the liter, home made pasta, grilled fish, and grilled lamb. It was bomb. View from GRK winery in Lombarda, Korcula Island. 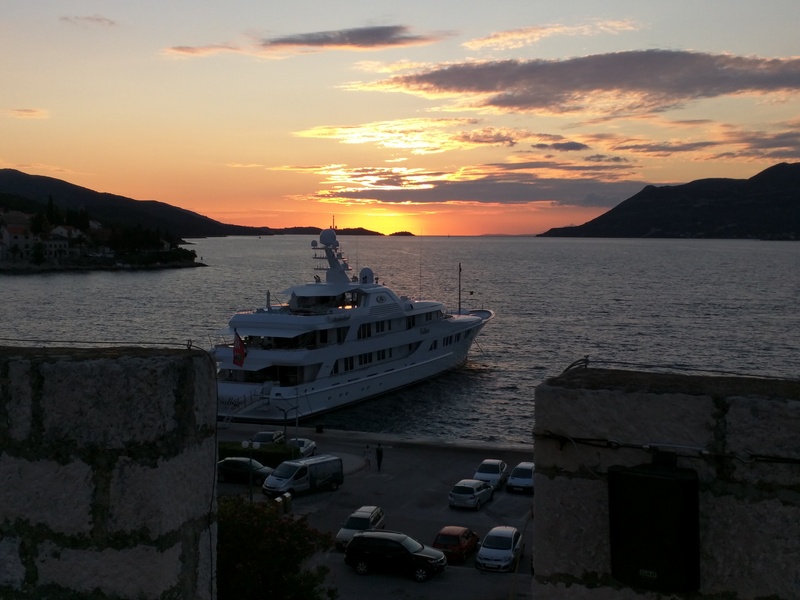 There is a ton of al fresco dining in Korcula along the wall that wraps around the city. There is also a really cool bar on top of one the towers where we saw the sunset. Getting to the bar is an experience because you have to climb up a 20 foot ladder and through a hatch door to get to the roof but the views were definitely worth it. 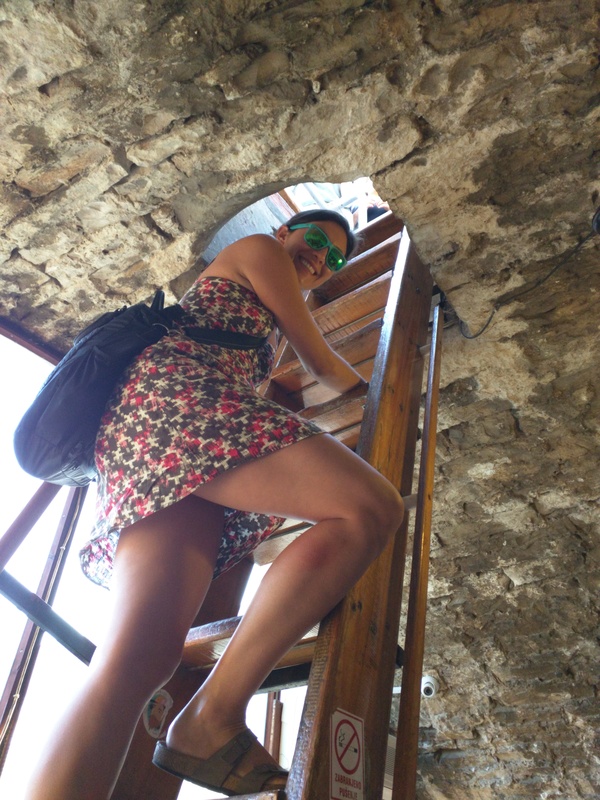 Kristin climbing up ladder to the rooftop castle bar. Ladies remember probably not the best place to wear skirts or heels. View from rooftop of old town Korcula. Rooftop sunset. Also notice the enormous yacht! Guess what. Its for rent just $415K/week!! After Korcula we took kept heading south to Mali Ston. 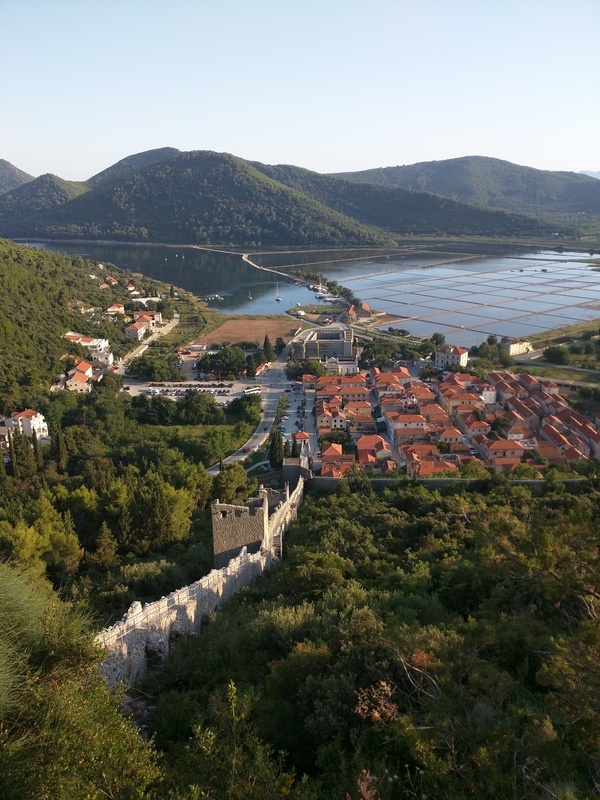 Mali Ston is on the mainland of Croatia and is known for its oyster and mussel cultivation. The larger town about a 20 minute walk is Ston which is known for its salt fields and the 2nd longest wall in the world (after the great wall of China). We took it pretty easy in Mali Ston since there wasn’t too much to do. We did end up walking the wall, seeing the salt flats, and gorging ourselves on mussels and oysters. Ston wall. View of Mali Ston. Ston Wall. View of Ston with salt fields in background. The Ston wall runs from Ston to Mali ston and is 4.3 miles long. A fun fact is there is a marathon in Ston every year up and over the wall. Walking the wall was a serious workout and left Dan and me sweating pretty hard by the end of the stairclimb from hell. We couldn’t believe that people run a marathon on this wall with it being so narrow and sketchy. 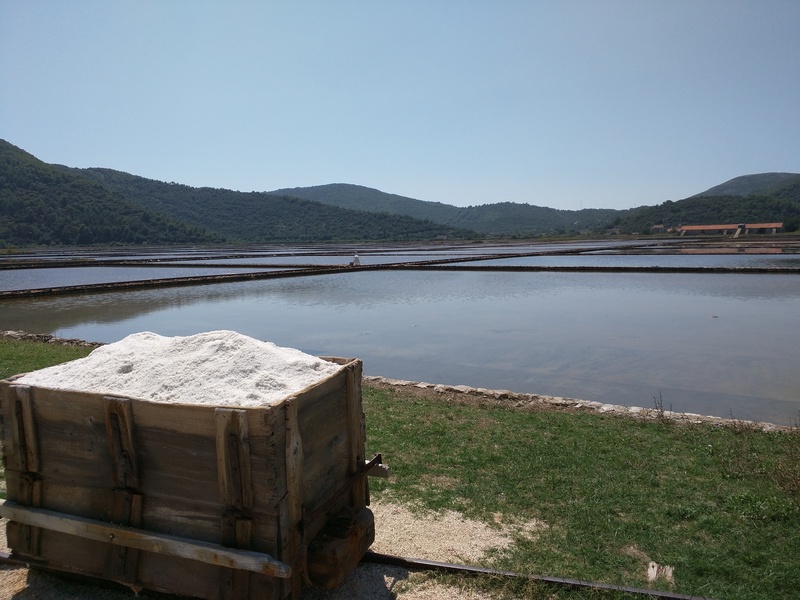 Since we wanted to make sure we experienced the two sites in Ston and Mali Ston we took the tour of the salt flats. This was the worst tour we have ever had and by tour I mean it is really just entrance into the salt flats that you can see through the fence on the road. The only of the tour that you can’t experience from outside the walls is a really well done (I’m being sarcastic) slideshow of pictures of the flats with music set to it. If for some reason you are even in Ston skip the tour and just buy some of the salt. Now to the reason we decided to head to Mali Ston in the first place. The oysters and mussels! We ate so many that we were sick of them by the time we left. 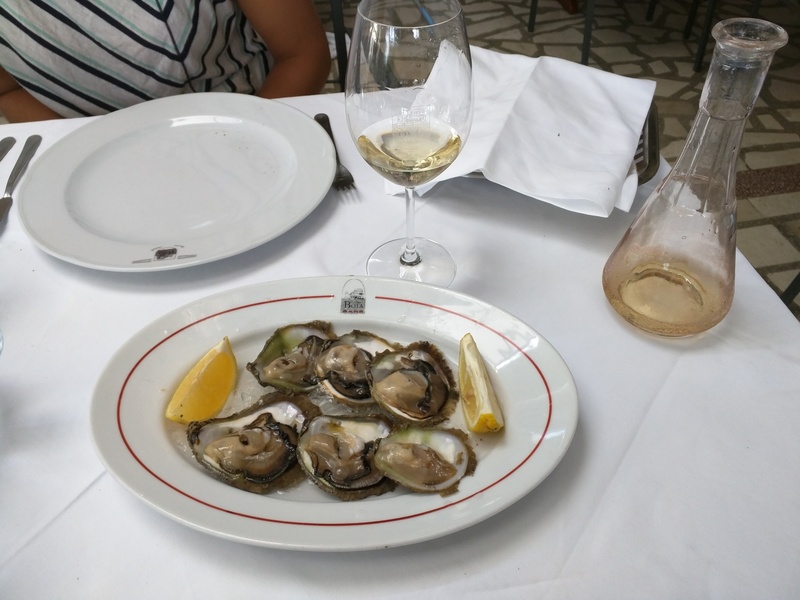 There was a shack near the water where we sat basically every day, ordered oysters, drank their homemade white wine, and chatted with the locals. These will be the freshest oysters we will ever have. They literally grab them out of the water and serve them to you. They also have different sizes of oysters available and the sizes are based on how old they are. The smallest are 4 years old and the largest are 10. We had no idea that oysters were so old when you ate them. No wonder they are so pricey. We also ended up buying 1.5 kilos of mussels from this stand and making our own steamed white wine, garlic, and onion mussels. Yummy! 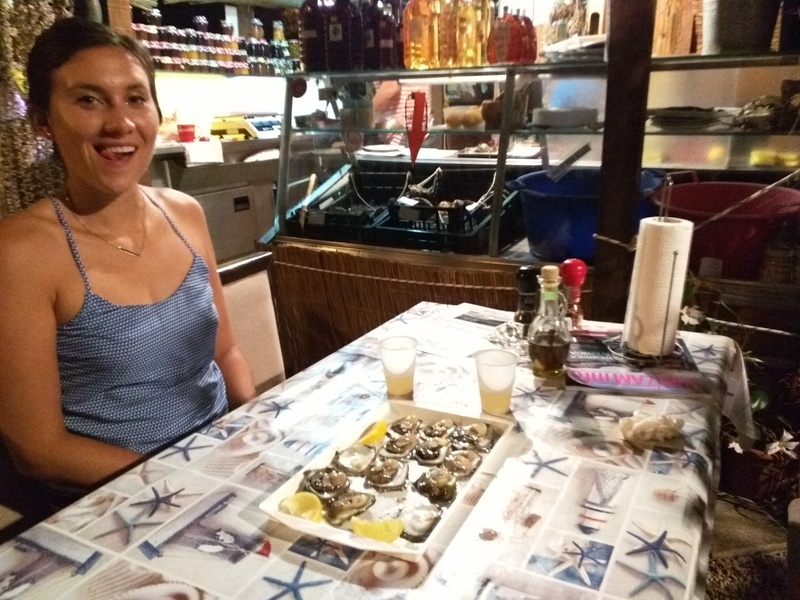 Oysters and cheap homemade wine at the oyster shack! See the crates of oysters in the background. Now off to the last stop in our tour of Croatia, Dubrovnik!